“Not only were their colors and patterns uncommonly fine, but clothes made of this cloth had a wonderful way of becoming invisible to anyone who was unfit for his office, or who was unusually stupid. The parallels today are painfully obvious. For years now, the FDA has taken an obnoxiously dogmatic approach to raw milk policy: “Raw milk is inherently dangerous,” is the tired mantra. The current FDA accusations against raw milk, on examination, hold up about as well as the theory that the earth is the center of the universe. Or flat. There is as much real-life basis to raw milk prohibition as there is to the Scientific Racism claims that led to Jim Crow laws of the 1800s and early 1900s. It is all utterly absurd. And, like the assertions of scientific racism, the FDA’s raw milk “science” just does not hold up when examined. Today, and thankfully so, peaceful people can sit beside each other on a bus, go to school together and drink from the same water fountain. In the same way, peaceful people should be able to come together in a voluntary and mutually beneficial arrangement for food and not be criminalized, punished or threatened for it. The zero tolerance standard for raw milk is, of course, wildly inconsistent. If policy-makers applied that standard to any other foods–cantaloupe or oysters–those foods would be banned as well, or see varying degrees of illegality in various states. There is no logic or rationale to the FDA’s policy. When asked to support their absurd claims, the bureaucrats at the FDA state that, since raw milk cannot be proven 100% safe at all times, it should not be available and no one should choose it. The recent hearing in Maryland about changing the state’s policy on cow shares, gave raw milk advocates the opportunity to dig deeper into the data on raw milk, creating a scientific paper on real raw milk risk assessment. Once again, raw milk is vindicated. Once again, the superior safety of raw milk with its track record of low incidence of illness associated with its consumption is proven, both scientifically and statistically. The FDA’s position on raw milk is based on data from manipulated statistics designed to maintain unjust and unsound regulatory prohibitions against regular people doing what people have done for all of human history. That is: to produce food and share it with their neighbors. 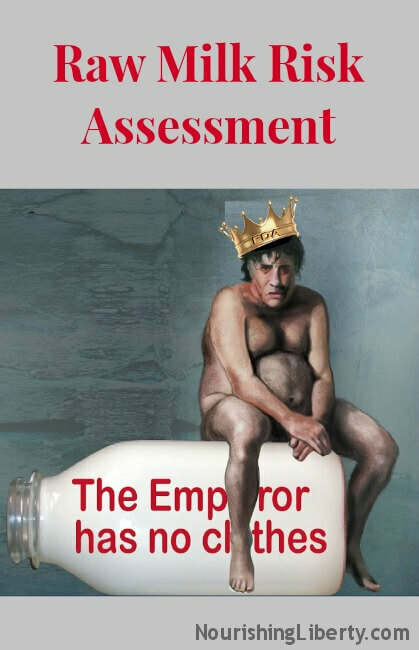 The crowds around the “emperor” are afraid of losing their jobs and insist that the emperor’s clothes are magnificent, too afraid to admit the truth. It is only a matter of time before the chorus of people singing “the emperor has no clothes” will reverse the FDA’s unfortunate trend of relying on cheap talk, rather than hard data for policy-setting. Until then, join me as a raw milk criminal! Correction – that was information from http://www.foodsafety.gov, not Food Safety News. Here is a story about raw milk you should watch.